Huge deposit of ice found under the surface of Mars. 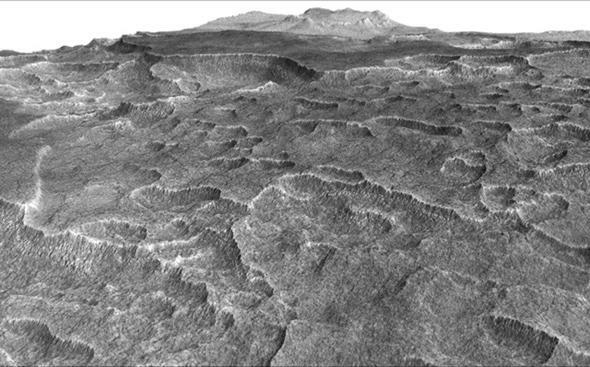 Scalloped terrain in Utopia Planita on Mars, the location of a huge ice field. Mars has long been a target of human curiosity. A blood-red eye in the sky, hanging, baleful. Our understanding of it has changed over time; it was thought to be somewhat Earth-like for a while, but then we sent space probes there and found it to be a desiccated, dead world. Well, at least for now. We have pretty conclusive evidence it once had plentiful liquid water on the surface, including lakes, rivers, and even oceans. That was eons ago; the solar wind stripped away the atmosphere from Mars, and the water mostly boiled away with the air. Mostly. We’ve known for a long time there’s lots of water ice on the planet; both poles have water ice caps on them several kilometers thick (in turn capped by seasonal layers of frozen carbon dioxide —dry ice— a few meters thick). You kinda expect that at the poles. But there’s also evidence for water just under the surface at mid-latitudes: Small impacts from asteroids have excavated ice that can be directly seen. These are wee craters, so it’s not clear just how much ice there is down there. But now scientists using a radar mapper on board the Mars Reconnaissance Orbiter (or MRO) have found more water ice at these lower latitudes, and a lot of it: The volume is enough to fill Lake Superior, the largest of the Great Lakes in North America. Yeah, that’s a lot of ice. Map of the ice field location. The shade of violet represents depth; dark is where the ice is 170 meters thick, and pale where it’s about 10. It’s located in a region called Utopia Planitia (Trek fans will recognize this as the location of the Starfleet Yards where the Enterprise-D was built), at a latitude of 45° north, so quite literally at mid-latitudes. While it’s only a tiny fraction of the total water ice known to exist on (or under) Mars, it doubles the amount known at these latitudes. It was found using a radar mapper on MRO. Called SHARAD, it sends pings of radar down to the surface, which are reflected back up to the satellite and recorded. Different substances reflect radar differently; the rocks on the surface aren’t particularly good at it, which is why the radar can penetrate the ground. Water, on the other hand, reflects radar quite well, so SHARAD can detect water ice down to a depth of a kilometer below the Martian surface. Scientists focused their attention on a region in Utopia Planitia that features lots of odd, scalloped terrain (aresain? ), which is similar to places on Earth in the Arctic that have underground ice. Combining the data from over 600 MRO passes indicates how much ice there is. The area of the ice deposit is over 300,000 square kilometers and the thickness ranges from 80 to 170 meters. So yeah, that’s a goodly supply of ice. A sample of the radar map in one location, showing the location of the bottom of the ice layer. This is pretty good news for future exploration and colonization plans. Ice is critical for Martian living; it can be melted to drink, broken into oxygen and hydrogen for air and rocket fuel, and can protect inhabitants from solar storms (on Earth our air does this, but Martian air is less than one percent as thick as ours; ice does an excellent job of absorbing radiation). One last thing: How did the ice get there? One idea is that Mars’ axial tilt varies wildly over time. When it flips, the poles become much closer to the previous equator. The ice sublimates, turning into a gas, which then recondenses in other locations. It can mix with dust and snow out in the mid-latitudes, eventually getting buried. That’s amazing. An entire planet flipping over like that! It’s hard to imagine what chaos that would wreak on the climate, even for a planet with so little air. Happily, our Moon provides stabilization against this kind of event; it torques the Earth’s axis and prevents it from making big excursions. Mars is weird. But that’s good! Studying it helps us put the Earth in context with the other planets, and in turn helps us understand our own planet. And that’s good, because we live here.